(The Contrarian Hungarian) A long weekend of protests began in the Hungarian capital: trade unions and civic organizations are taking to the street with their many grievances against their government. This post is continually updated with the news coming out of Hungary – check back for more as the weekend progresses! D-Day demonstration on Kossuth Square, October 1, 2011. Photo by Népszava.hu. 7:30 p.m. According to a TV report (by no other than atv.hu! ), some walked away disappointed from the demonstration at Kossuth Square because they did not receive anything other than encouraging speeches and there could not have been more than 10,000 people at the event. Here’s another picture of the CROWD. Less than 10,000? 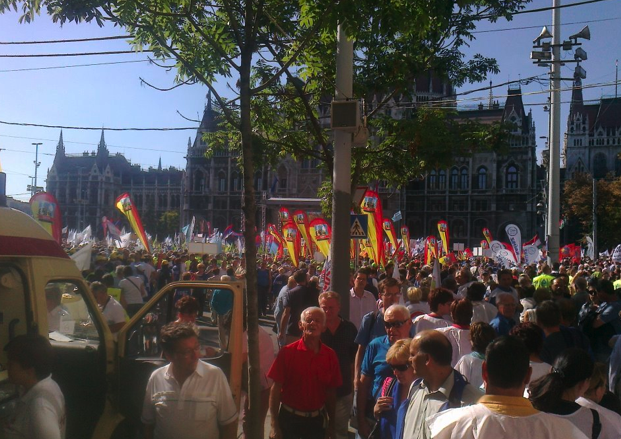 A smallish crowd gather on Kossuth Square for the D-Day demonstration on October 1, 2011. Photo by Facebook user – the crowd is not pictured on the photos of the official media outlets. 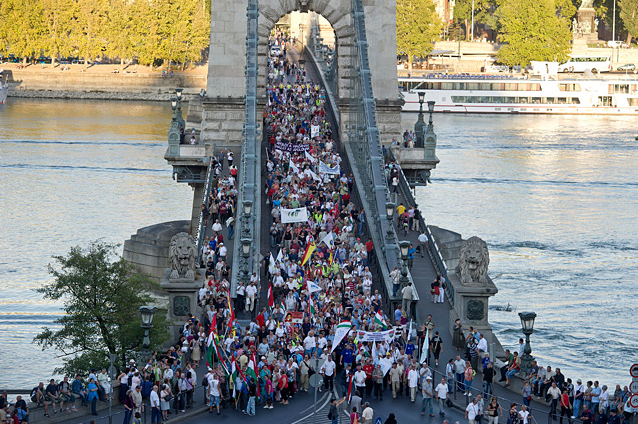 D-Day protesters on the Chainbridge, crossing from the demonstration in Pest to the location of the sitting strike in Buda. October 1, 2011. More CROWD on the pictures of Facebook users. The state-operated news agency did not think this newsworthy until half-way into the program. 6 p.m. Rumor has it that there will be a “street party” at Clark Square. In the meantime, these pictures posted on Facebook, taken by one of the participants, give a much better sense of the crowd than any other I have seen taken by the professional media. From the pictures of a private individual posted on Facebook. 5:30 p.m. “Many thousands” of protesters are marching toward Clark Square, chanting the slogan they’ve been chanting throughout the weekend: “Orbán, takarodj, vidd az összes haverod” (Orbán, get lost, and take all your buddies with you). 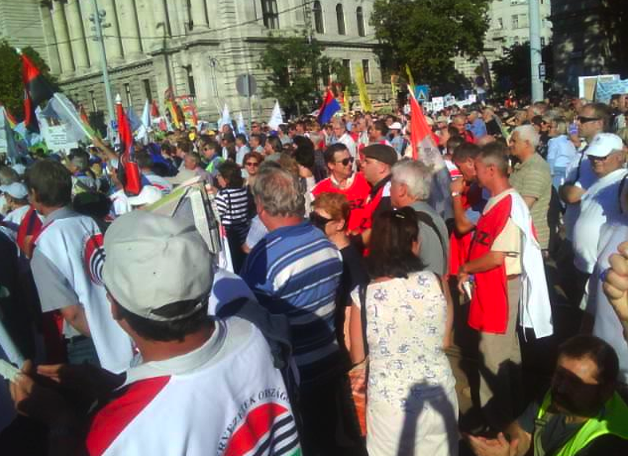 Though I could not find anything more on this in the Hungarian news media, the demonstration ended by the founding of the “Hungarian Solidarity Movement.” Before leaving, the crowd turned their backs on the Parliament and held a minute of silence. The picture was sent by a private individual to the event’s Facebook page. 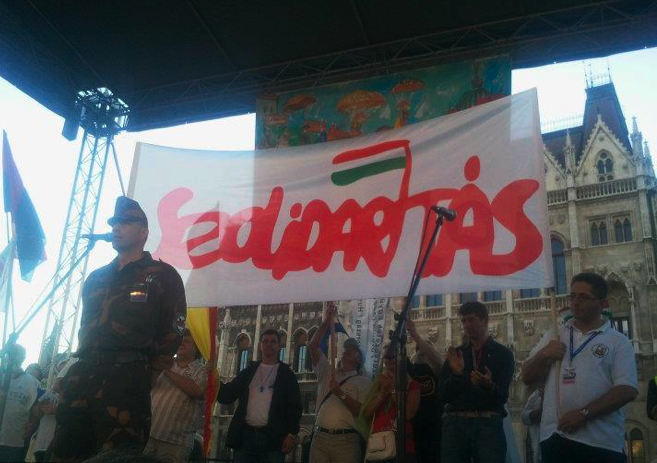 Photo posted on Facebook: with copious references to Solidarnost, the event ended in forming the Hungarian Solidarity Movement. 5:15 p.m. The demonstration ended on Kossuth Square and the crowd is now starting to walk to Clark Square in Buda to join the sitting strike there. 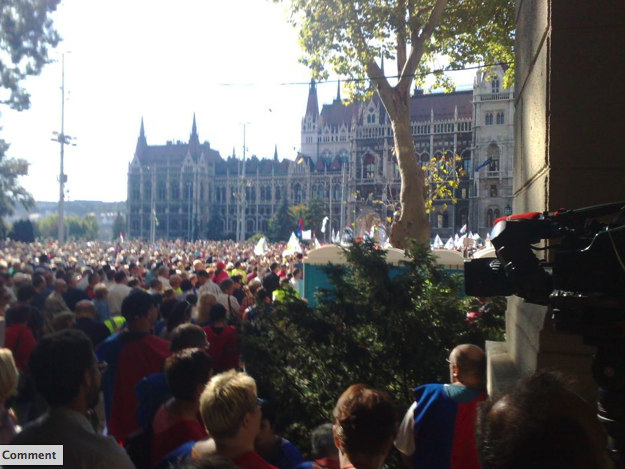 On the size of the crowds: headlines in the media outlets stick to the generic term “many thousands.” At the same time, many also report that the crowd filled the square and overflew to Vértanúk tere and Alkotmány Street – that would be many tens of thousands. 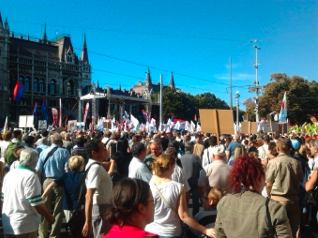 4:30 p.m. 50 to 60,000 demonstrators on Kossuth Square. 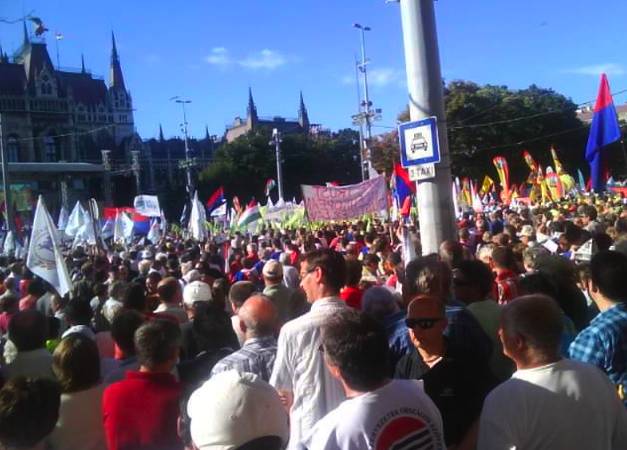 In the meantime, there is almost complete indifference about the event in the Hungarian media. 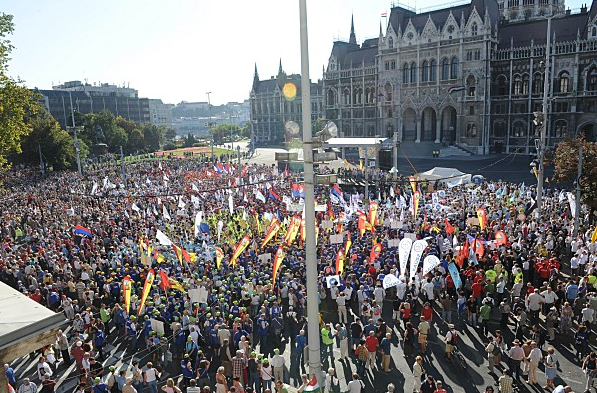 The picture below is the only picture one could find of a sizable crowd 2 hours into the protest anywhere on the Hungarian internet. There is a lesser-known internet site, http://www.nepmedia.hu which has a live video feed of the speeches. Klubrádió started a live broadcast, but soon switched back to regular programming. No mention of the demonstration on HírTV in its half-hourly news summary. Many are tuned into a D-Day Live Facebook page, which alternates short summaries from the protesters with lots of complaints about the non-existent media coverage. Origo.hu has a live feed, though not at all as informative as the live Facebook page. They have yet to post a picture of the crowd. For now, every single one of their pictures is of individuals, who are almost exclusively set against some kind of empty space. The coverage from Index.hu did not appear until about half an hour before the event. 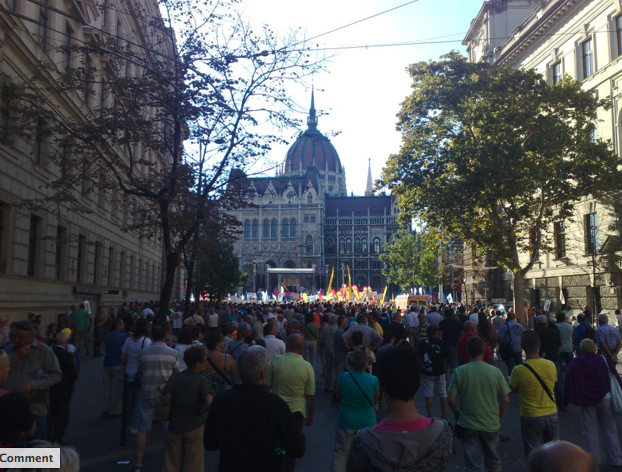 MTI, the Hungarian news agency released its first report of the demonstration half hour after the event had already been under way. It is a brief report: 3 short paragraphs summarizing D-Day, followed by 3 lengthier paragraphs from yesterday’s press release by the government dismissing the protesters’ demands. The red and blue contingent: steel workers. 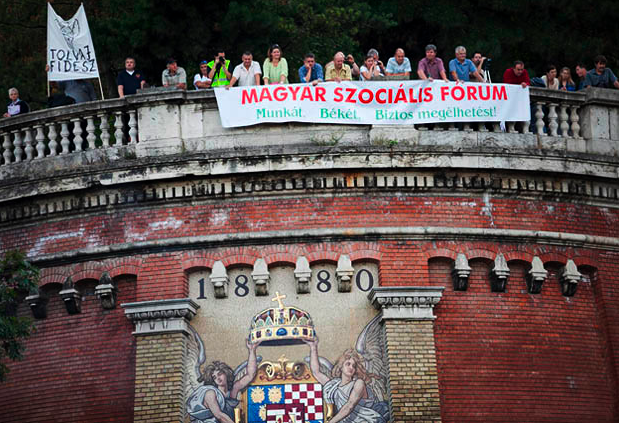 The banner says “Viktor, if you don’t know about it, don’t fiddle with it.” Photo by Koszticsák Szilárd of MTI. 3 p.m. With a lengthy reading of the names of the unions and civic organizations behind the demonstration, and with a reading of the 1950 poem “One Sentence About Tyranny,” as well as international letters of solidarity, the protest is now under way. 2:30 p.m. At 2 p.m., reporters estimate the crowd at 25 to 30 thousand, according to the organizers, there are 50,000 protesters on Kossuth Square. 2 p.m. The demonstration on Kossuth Square is not going to begin on time. Many of the buses are still on their way from various points in the country. Yesterday, there were rumors that the police would be instructed to hold routine traffic controls today to slow down buses and carpools bringing demonstrators to the event. 7:30 p.m. The participants of the round table discussion filled the location of the even (the square where the even took place was on the smaller side though). Speakers analyzed the government’s policies on education, health care, retirement benefits, unemployment and poverty. A two-third majority does not amount to superior knowledge, stated one of them. Democracy means dialogue, and where this is not known, one will find war instead. 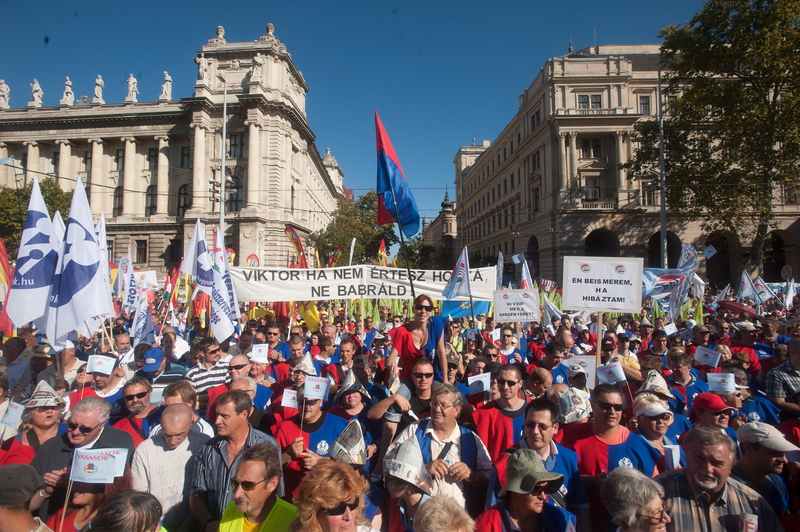 Afterwards, several hundreds of the participants of the event in Pest walked over to the other side of the Danube to join in the ongoing sitting strike on Clark Ádám Square. 4 p.m. Today’s event, the round-table discussion on how to organize civil society as a political force capable of restoring democracy and rights to Hungary begins at 5 p.m. (at Imre Nagy’s statue, close to the Parliament). As far as the media’s attention is concerned, however, the day clearly belonged to the government. The government’s spokesperson released a lengthy statement to the press, in which he accuses the trade union leaders of placing their personal political ambitions above the interest of the people. The government is not going to change its position about transforming the country or about their proposal for the new employment law, he stated. Regarding the issue of early retirement, they consider it untenable in a “moral sense” that individuals otherwise healthy and ready to work should receive a pension while they are still capable for useful work on behalf of the community. There has never been society-wide arbitration at this scale and with such efficiency, said another government politician, Péter Harrach to the press about the unions’ demands. This happens to be true: it was the current government that dissolved the Council for National Arbitration (Országos Érdekegyeztető Tanács), the institution that used to forge agreement among employers, unions and the government on labor issues. Since then, the government only negotiates with its own unions (these are confederated into Liga – not a participant of these protests), while the autonomous trade unions are regularly excluded from these talks. 10 p.m. No reports yet about the planned physical exercise of the protesters. Hungary’s state radio makes a less than 40-second mention of D-Day in its 18 minute survey of the events of the day during its 10 p.m. news magazine (news media not affiliated with the government do provide more extensive reporting). During the rest of the afternoon, the protesters were going to do a bit of exercise. They call it ”Country-Protection Running,” which is a sarcastic take on the overblown rhetoric of Prime Minister Viktor Orbán’s recent “country protection plan” (which, by the way, is an economic package; most famously, it includes the forex mortgage repayment bill). More on the symbolism behind D-Day – from a speech this afternoon: just as D-Day brought peace after the war, so will this D-Day bring democracy and rights to Hungary. Just as the constitution passed into legislation by the Fidesz government was the end of the beginning, so is this protest the beginning of the end for the Fidesz government. Small contingent of protesters above Clark Square. Photo by Bálint Hirling, origo.hu. Protesters sitting on Clark Square. Photo by Zsolt Reviczky of Népszabadság. The sitting strike in its initial phase. 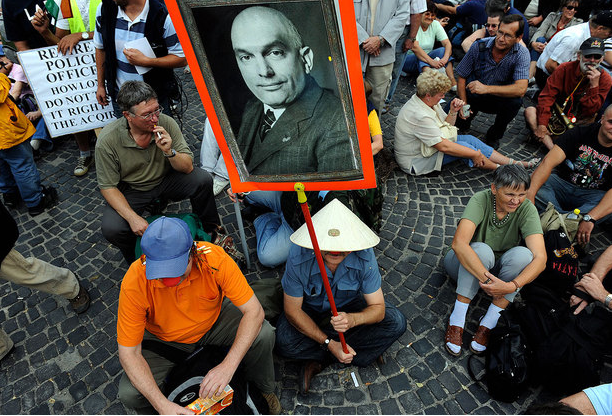 The picture is a clever photoshop of the face of Viktor Orbán, the country’s current prime minister, and Mátyás Rákosi, the communist dictator of Hungary’s Stalin-style regime before 1956. 6 p.m. The event at Clark Ádám Square got off to a great start. 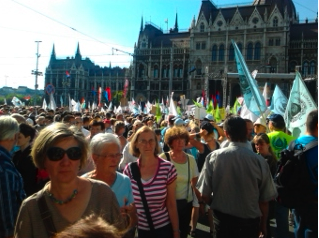 Early in the afternoon, [Origo] put the number of the crowd to about 1000. So far, there is space for everyone on the sidewalks, traffic is moving through the square, though far slower than usual. Some are already sitting. Mattresses and other sit-in gear are at hand. Most of the signs protest the government, a few carry messages against the far right. Earlier, the event started off with speeches, some political theatre, and a picnic. Hundreds were attendance, mostly members of the firefighters’, soldiers’ and policemen’s unions, though a huge banner also testified to the presence of nurses. The unions representing the former professions have been very persistent since the spring to protest against the government in defense of their early retirement options, which are being slashed retroactively. It is perhaps the armed force’s leadership initiative in the protests that explains the choice of the name “D-Day” for the events. As Péter Kónya, one of the organizers stated in his speech, they picked it because, according to Winston Churchill, D-Day was the beginning of the end. In the meantime, another main organizer, Kornél Árok provided symbolic enactment of D-Day as he descended on ropes into the event. The first to arrive in Normandy were the parachute units, he said upon arriving. The units at Clark Square are the first arrivals – the main forces of D-Day are not to arrive until Saturday (the day of the mass demonstration outside of the Hungarian Parliament). 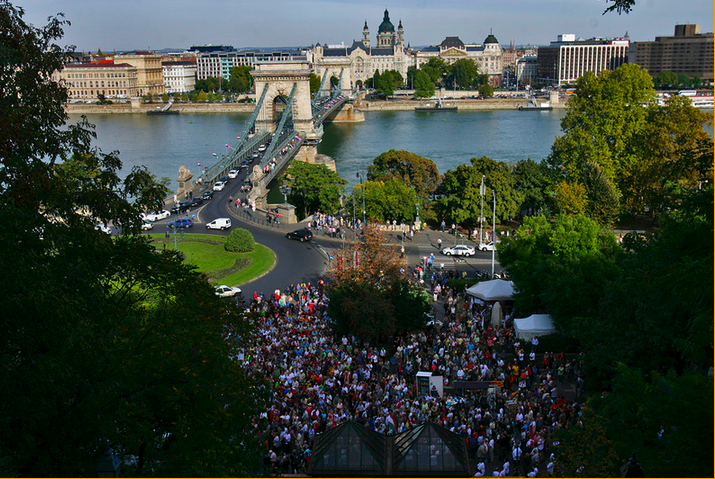 A group of four organizers was dispatched to deliver a petition to Pál Schmitt, Hungary’s President, whose residence is just a short hike up on top of Buda Castle Hill. Unfortunately, Mr. Schmitt could not be available to receive the protesters as he was busy with the visit of the Croatian head of state, but his deputy promised delivery of the document to him on Friday. For schedule of events and background, see this post. (Amnesty.org) The Hungarian authorities must act to aid victims of racially motivated attacks, Amnesty International said ahead of the Budapest trial tomorrow of four people suspected over a series of killings of Roma. “As this long awaited trial begins, the protection of Roma communities in Hungary from racial harassment and violence should be a top priority,” said Barbora Cernusakova, Amnesty International’s Hungary expert. The attacks traumatized the Romani community in Hungary, which has been living in fear of further violence. Following an anti-Roma march by the far-right Jobbik party on 6 March in the village of Gyöngyöspata, three vigilante groups have been ‘patrolling’ the area harassing and intimidating Romani residents. Local Roma have allegedly been racially abused and are scared of possible future attacks. The groups have said their next activities will target the town of Hajdúhadháza, where they have announced a march for 1 April 2011. “The trial starting tomorrow must send a signal to society that the rights of Romani communities are protected from violent attacks and harassment, including examples of such harassment in Gyöngyöspata and elsewhere” said Barbora Cernusakova.